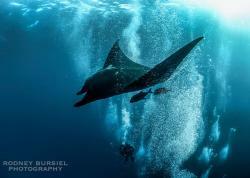 Great beach dive conditions in Southern California. The sun is shining, the surf is small and your next boat trip isn’t for two more weeks… Time to do some beach diving. A successful beach dive is both safe and fun, and it takes preparation to consistently walk onto the beach smiling. The tips and tricks to diving from the shore are learned through many dives, common sense, diving with those more experienced, and time spent in and around the ocean regardless of whether you have a tank(s) on your back. Here are a few tricks to jumpstart that process. 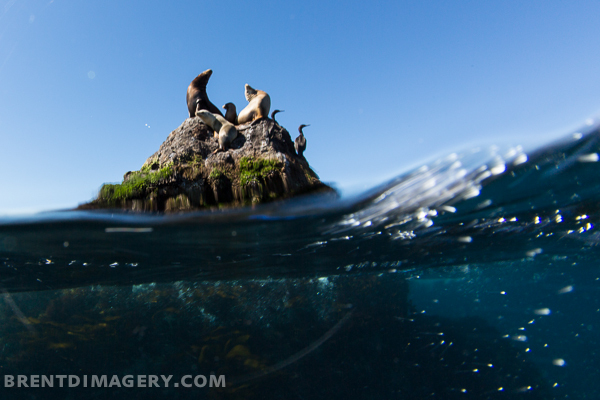 Another great California beach dive. The most basic consideration is determining ocean conditions. Is there swell in the water? If so, what is the angle? The swell period? What has the wind been up to? The tides? Each of these factors has an effect on the waves, surge during the dive and overall visibility. 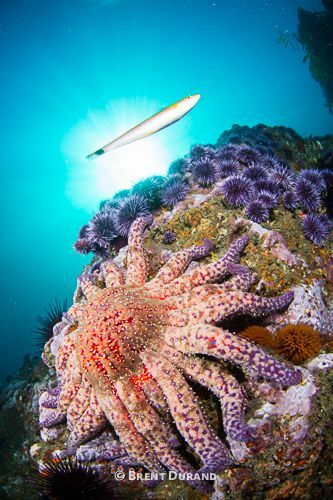 Different dive spots are affected differently – some may develop a surface current due to wind, some may lose visibility dramatically as the tide drops and some may have excellent vis even though there’s a solid South swell in the water. 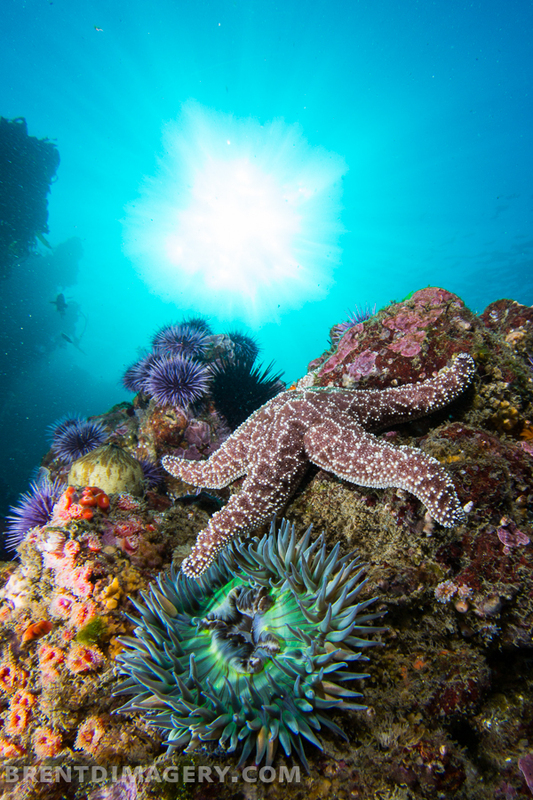 The key is to know the ideal conditions for your local beach dive sites. Many online forecasting tools are available, and they’re getting better every day. Some swells may trick you into thinking the ocean is flat before pulsing in a long procession of waves. Once at the beach, a smart diver spends a few minutes watching the ocean, learning the rhythm of the swell sets. Some swells may have very consistent small waves and some may trick you into thinking the ocean is flat before showing up in a long procession of 6 foot faces. By watching the sets, divers can time their entry (and exit) immediately after a set of larger waves, making the swim through the impact zone hassle-free. 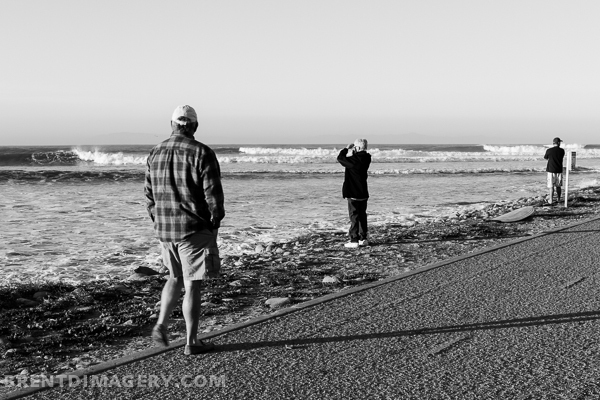 As photographers, it’s well worth the time in order to avoid battling through surf with a camera rig. And don’t stop paying attention once submerged – you can often feel the surge from sets rolling along the bottom mid-dive. Boat divers are often treated to an anchor or stern line to use as an aide in descending. Beach divers don’t have this luxury and instead will do a free descent. In poor visibility it’s easy to feel sensations of vertigo, but an easy fix is to focus on your dive computer while descending, or strands of kelp if available. 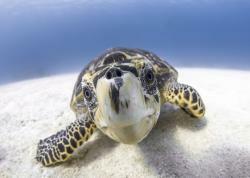 Just make sure to optimize buoyancy before hitting the bottom – the last thing an underwater photographer wants is to touch the sand or reef and stir things up. There are many tricks to navigating without a compass while beachdiving. Compasses are useful for navigation for obvious reasons, however beach divers can also navigate by looking at the ridgelines in the sand. These ridges form parallel with the shore and will aid in swimming out and back or at a diagonal line from the shore. Strong surge can cause sand to drift over the ridges but it’s usually possible to find a gap in between surges for reorientation or to find darker-than-sand objects to maintain orientation. Sand moves much faster in surge than a hovering diver does. This is an obvious tip that most don’t think about…. Rinse off! Some public beaches have showers, but many don’t. My solution is to bring a small jerry-can filled with hot water. The jerry-can is wrapped in neoprene and stays as warm as I filled it for hours. Then I wrap my towel around it. Nothing beats this warm water flush and a warm towel after exiting from a cold night dive while changing on windy PCH. 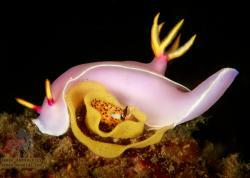 A Philidiana hiltoni nudibranch scowls while being swung back and forth in the surge. Along these lines, photographers should try to carry a portable rinse tank. I keep a large tupperware bin with water in it in my car, and my camera rig goes in there as soon as I open the car up. This is a great soak for the housing and strobes, and once home I push the buttons and am ready to dry off my gear – no additional time required. Very helpful after long weeknight dives when it’s already 12am. 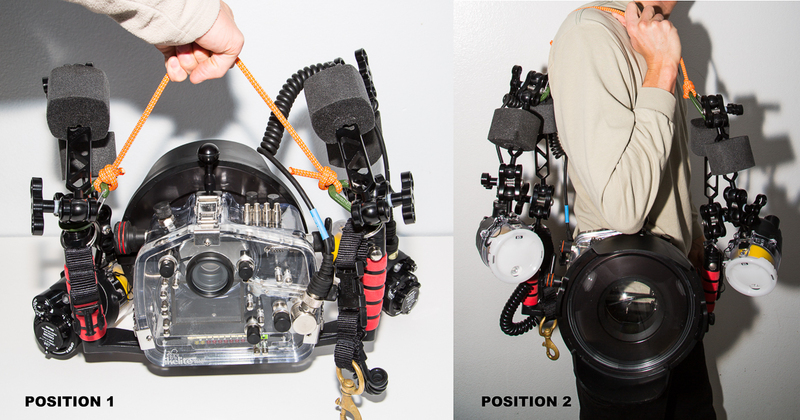 There are a few tricks to carrying a heavy underwater camera rig while beach diving. The first is to attach the rig to your chest for entry and exit. This allows a diver to keep arms and legs free with a balanced center of gravity. Check out Michael Ziegler’s article on how to do this here. I also put my gloves between the back of my housing and my BC to avoid scratching on long walks and hikes up/down cliffs. 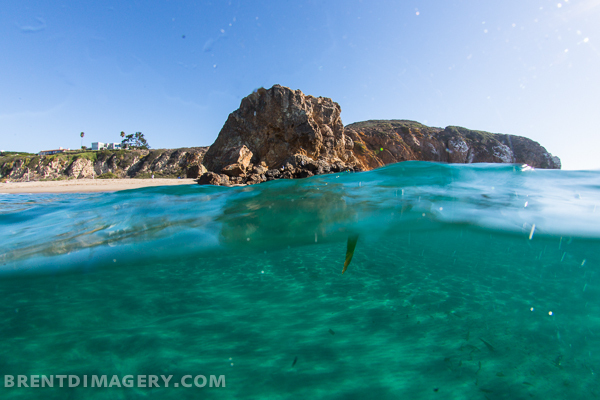 Sometimes long hikes and swims are required to access remote beach dive sites. The reward is often there. The other useful carrying technique is to use a handle on your underwater photo rig. This is great as a handle for boat dives in position 1, but also turns into a shoulder strap (position 2) in case you have a long walk without your BCD/tank to clip to. I made my camera handle with fisherman knots and two small caribiners. Michael Zeigler offers a great tutorial on creating a different handle here. The second-to-last tip is to stay fit. Beach diving can be strenuous, whether you’re swimming to a deep reef or exiting the water in steep soft sand. Fitness plays a major role in preventing injury and over-exertion and doesn’t have to be a grueling workout at the gym. Hiking, riding bikes, swimming, surfing, freediving and other sports are all great cross-training activities to prepare you for a comfortable beach dive. And dive two. And dive three. Start With a Warm Suit! The last tip for beach diving comes from years of surfing until after dark and paddling back out before sunrise the next morning in the winter. If you’re ever dreading putting an icy cold and wet wetsuit back on in the morning, turn it inside out and put it on the floor of the passenger seat in your car. Then crank that heat by your feet on the way to the beach and change into a toasty warm suit. If that doesn’t put a smile on your face, then get on that next boat asap! 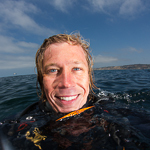 Brent Durand is an avid California beach diver and underwater photographer. 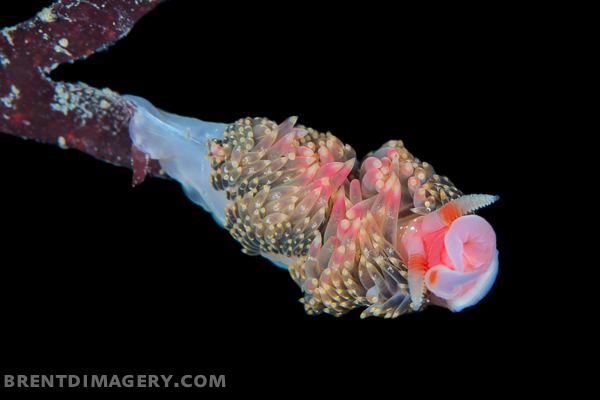 You can follow UWPG on Facebook and also read Brent's Story Behind the Shot: Melibe leonina nudibranchs. Submitted by deepdiver23 on Mon, 2013-02-04 10:27. Any recommended sites for finding out beach conditions? Submitted by travisball on Mon, 2013-02-04 12:48.